My name is Kotaro who staying in Japan with a Nepali husband, Aran. Since my husband is laso learning Kanji with me, I have started to make our own drill of Kanji and think this also could assist someone who is learning Japanese, specially Kanji. This is for someone who have mastered Hiragana and Katakana. Then... let's get started ! 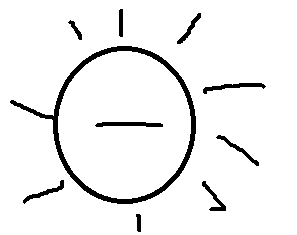 今 （ima） now, current, present. what to mean :This year is the first New Year in Japan. We pronounce 日本 both nippon and nihon. I suggest 今 from this sentence first. I have realized that this kanji is changed its pronounciations when this conbined other kanji variously. 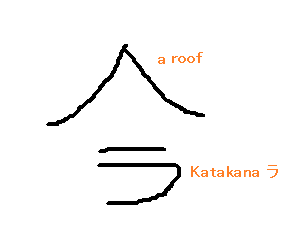 今日（kyou) today - this is the one to pronounce kyo...., i believe..
HOW TO remember：above one is like a roof. Under the roof, katakana "ラ" is situated. Next, 日 from 日本, you defnetely know what 日本 is. This name means... from Wikipedia. 一日（tsuitachi) first day of a month- this is the one to pronounce tachi, i believe..
HOW TO remember : This is really from the shape of the sun. Circle and dot centered was transformed 日. Last one is 月 today. 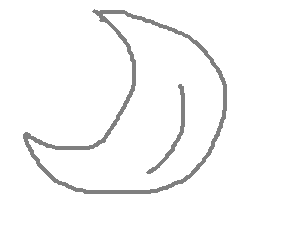 This was created from the shape of crescent moon.